KSO is always acquiring new certifications. If you do not see a credential that matches your need, please give us a call at (630) 372-1200. 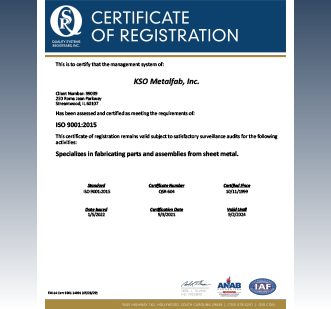 KSO MetalFab Inc. is a certified WBDE (Women's Business Development Enterprise) Illinois-based Company. KSO MetalFab Inc. specializes in providing full service vertically integrated precision sheet metal fabrication and machining for both prototyping and production requirements. © 2019 KSO Metalfab, Inc.